Home > Motorcycle Events and Safety > SHARE THE ROAD WITH MOTORCYCLES! Here at Roadrunner Law, we’re all making summer travel plans–and for some of us, that means a summer road trip. I’m planning on taking my family of six all the way from Albuquerque to Glacier National Park this summer via Interstate 15. But while we’re making plans for fun summer travel, we’re also making plans for SAFE summer travel. And being safe means sharing the road and watching for motorcycles! According to the National Highway Traffic Safety Administration, in 2016 “5,286 motorcyclists were killed in motor vehicle traffic crashes”an increase of 5.1 percent from the 5,029 motorcyclists killed in 2015.” The Motorcycle Safety Foundation provides some explanation for the increase in crashes, including fatal collisions. Simply put, motorcycles utilize the road differently than vehicles. For example, many drivers don’t understand how motorcycles maneuver within their lanes to avoid potholes or loose gravel, or that motorcycles don’t always use the brakes, instead downshifting or rolling off the throttle to slow for road debris. Many drivers also have poor spatial understanding, and can’t tell how far away an approaching motorcycle is (leading to a high number of “left turn” crashes), or can’t tell the distance between the front of their vehicle and the rear of the motorcycle in front of them (leading to a high number of rear-end accidents). Also, unfortunately many drivers fail to check their blind spots. Since motorcycles are smaller than cars, they occupy a different blind space, and lane changes end up causing accidents more often than they should because of simple driver negligence. Be aware of turning motorcycles. Because motorcycles are smaller than cars, and because they move differently in their lane, cars don’t always realize that a motorcycle is preparing to make a turn. Watch for motorcycle signals–hand signals or lights on the bike–that let you know what a motorcyclist is planning. Even more importantly–slow down and give them a few extra moments to make their move! It doesn’t cost you anything to be a patient, courteous driver. 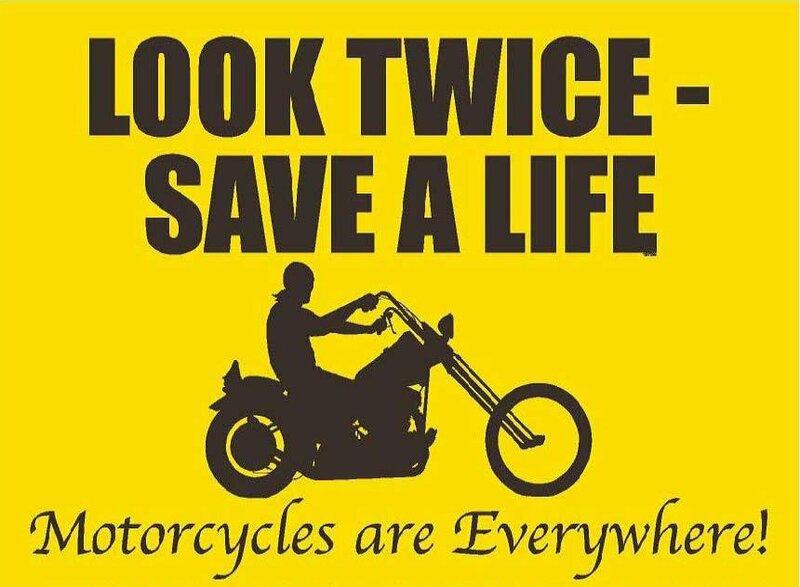 Motorcycles don’t occupy the same space in your blind spot as a car or truck! Don’t just rely on your mirrors. Take a few extra seconds to look behind you by physically turning your head and looking behind your shoulder. Ask your backseat occupants to let you know when you have motorcyclists to your rear. Listen for the roar of a motorcycle engine–motorcycles are loud for a reason! Turn down your stereo and become aware of your surroundings! Motorcycles maneuver differently than cars! Motorcycles need to move within their lanes of traffic more frequently than cars, to avoid debris and road hazards. Give them some space! Don’t crowd motorcycles, and DON’T TAILGATE. Motorcyclists often have to make quick decisions with regard to navigation, so an extra car length can really mean the difference between life and death for a biker. Use your signals!Â If necessary, tap your horn to make surrounding motorcyclists aware of your intentions. Check your blind spots carefully, and change lanes S-L-O-W-L-Y! What’s the rush? A few extra seconds could save a life! Make sure you have enough time to make a left turn! The motorcyclist wasn’t speeding. The driver of the car just didn’t understand the spatial dynamics involved. The motorcycle is smaller on the horizon than the driver is used to, so the driver thinks the motorcycle is farther away than it really is, and that lapse in judgment leads to accidents more often than it should. The solution is easy. If you see a motorcycle coming when you’re making a left-hand turn–WAIT FOR THEM TO PASS. It costs you a few seconds. It could easily save a life. If you’re traveling this summer with kids, you’ll need ways to entertain them. Most of us medicate our kids with screens these days, but a good way to help kids get in the habit of identifying motorcycles early is this game. It’s simple–have your kids count the number of motorcycles they see. You can assign each kid a different color to count, or a different kind of bike. They’ll start looking for motorcycles, and it will help them become more aware of the number of bikes on the road, which can only help them when they start to drive themselves! SLOW DOWN. BREATHE. ENJOY YOUR TRAVELS. In this world of rush, rush, rush, it’s hard to slow down, even when we’re on vacation. But just a few extra moments could truly save the life of a motorcyclist. And by taking those few extra seconds to check your blind spot, change lanes safely, or let a motorcyclist pass before making a left turn, you could be saving a mother, a father, a brother, a sister, a friend.